For four hours the stage rocked with a steady stream of acts, performing two to three songs each. Mandolins, masks, mashups and mashed potatoes greeted a horde of hungry listeners at the Chilmark potluck jam on Saturday night. And that doesn’t even include the 20 minutes of improvisational jamming from a talented man named, quite aptly, Musica. Mr. O’Gorman, who has Santa’s beard but not his belly, showed up to the first jam over a decade ago and estimates he’s been to at least 40 since. The jams are a Chilmark offseason mainstay, with musicians performing two to three-song sets while listeners feast on the bounty of a Vineyard potluck. Although musician Alex Karalekas, who started the jams 10 years ago, couldn’t attend, his friend and longtime fellow potluck jammer Willy Mason filled in as the impromptu emcee. Part of the fun of the potluck jam is that most of the set lists aren’t set, and many of the songs have never before been sung onstage. Saturday was no different. “I had no idea what I was going to play,” said David Stanwood, who performed an improvisational piano piece. He was familiar with the grand piano, however — it’s the same one he has at home. “It was here yesterday for the chamber music concert and I just said, hey, why don’t you leave it and I’ll play something like it’s my living room,” Mr. Stanwood said. The Biskis family also felt at home onstage, starting things off with a filial rendition of Joe Cocker’s Feelin’ Alright. Mrs. Biskis, or as she’s known onstage, Missis Biskis, was on acoustic guitar and vocals, while her husband Tauras played the slide guitar. Their children Kestutis and Tauras provided accompaniment on the piano and drums. For the next four hours, a steady stream of musical acts followed, as varied and unique as the accompanying smorgasbord in the Chilmark Community Center foyer. Just as blueberry buckle and broccoli salad shared space on listeners’ plates, singer-songwriters, folk bands, bluegrass acts, piano improvisers, and one guy with an electric guitar, a weird story to tell and a neocolonial Plaster of Paris mask (his name is Milo Silva and you really just had to be there) shared the stage with one another. They couldn’t have been happier. “The community energy, seeing kids in the audience. 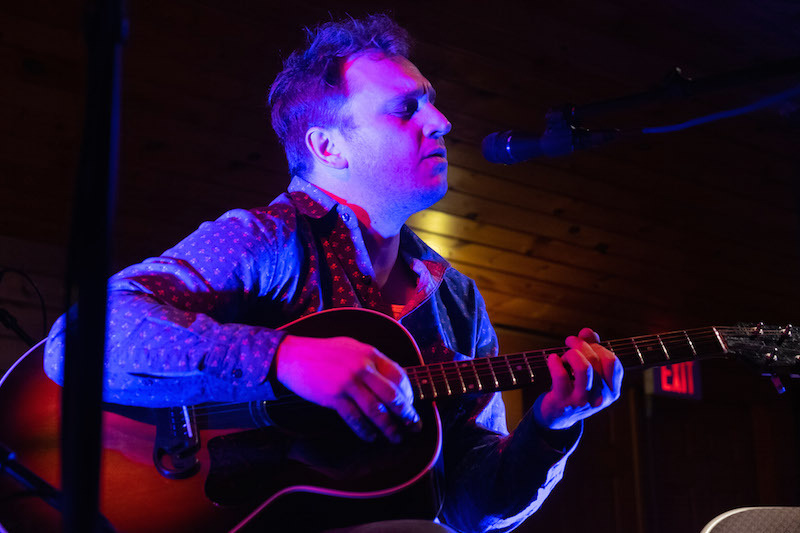 That’s what I really love about it,” said performer Rob Lytle, who’s been coming to the jams for years. This year he sang a song about his son Alexander. “I wrote this song primarily when my son was a young baby, and he’s 19 now,” Mr. Lytle said. Willy Mason performed and took over emcee duties as Alex Karalekas, the longtime organizer, was home with a cold. With his son soon off to college, Mr. Lytle had to add another verse. The piece, like his son, was 19 years in the making. Performer Chrysal Parrot followed her two daughters onstage, who performed a duet of Ed Sheeran’s song, A Team. 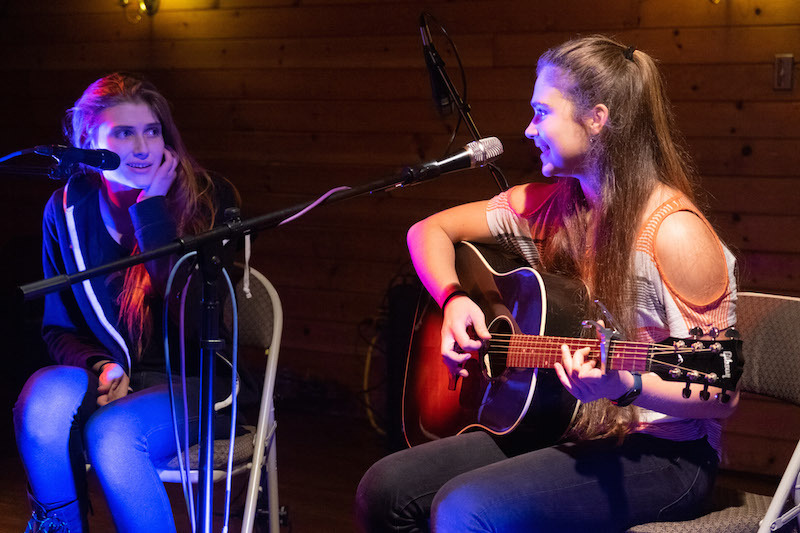 Emmanuelle Woodford, who’s 15, played the guitar while her older sister, Chloe Loftfield, accompanied on vocals. 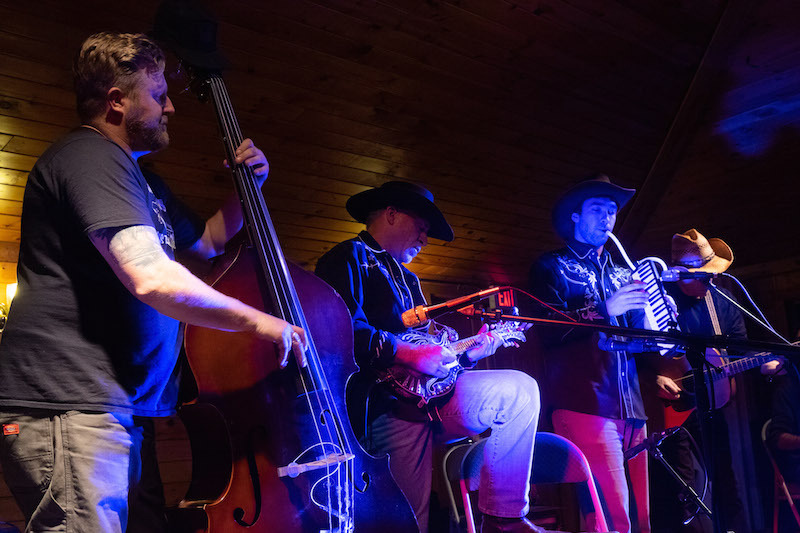 Talent and family spread far and wide throughout the community center on Saturday, from the fast fingers of Chuck Giordano on the mandolin to the even faster ones of Teddy Karalekas in the kitchen. After Musica Sky melted faces with an improvisational guitar solo, and Laura Walton, Elisha Wiesner and Brad Tucker impressed with their singer-songwriter skills, Rick O’Gorman’s Chilmark version of The Youngblood’s famous tune, Get Together, captured both the spirit and tone of yet another Chilmark potluck jam. Sounds amazing! Was it at the Chilmark Community Center?